With each season comes a set of new styles to try. For summer 2012 I’m pleased to announce the emergence of the high-low dress as a must-have look. These dresses which are shorter in the front and longer in the back are sure to turn heads anywhere. I’ve always been one to shy away from wearing longer dresses because I’ve felt too small to pull them off, but this new look really complements my petite stature. With the shorter hemline in the front, there’s no danger of me eating pavement in an attempt to walk in skyscraper heels -- a pair of flats will easily suffice. Along with their unique hemline, these dresses are also very versatile. For a simple day outing you can match them with a cute pair of flats or summer sandals, and maybe add a jeans-vest to the look. However, they can also be worn on fancier occasions with a pair of heels and a statement clutch. If you’re a belt fanatic, you can get good use out of those skinny belts as well. 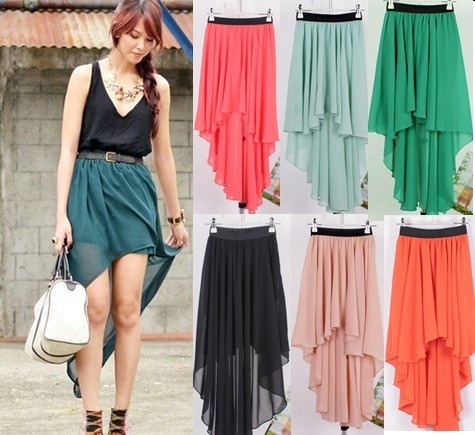 An extension of the High-Low dress is the High-Low skirt, and those are also a trend to watch for this summer. With the High-Low skirt, fashionistas can get a bit more creative with their looks by playing around with different tops: halters, bandeaus, tube tops and blouses are just a few. There really is no limit with what you can do with this look. This summer, drop those mini skirts and add something with a bit more moxie to your closet! wat i mean is for the black one. where can u get it. also for the others with the different colors where can u get it??? Where can I find the first picture, the dress on the left? The purple one.